COMP Cams Elite Race Triple Valve Springs Seat Load: 382 @ 2.100"
Seat Load: 382 @ 2.100"
Open Load: 1067 @ 1.200"
Comp Cams Elite Race Triple Valve Springs have a 1.00" maximum lift and outside diameter of 1.677". Designed for use with roller cams and with a 9,000 to 10,000 RPM capacity, they are widely used in Pro Stock and Competition Eliminator, as well as marine and tractor pull applications. 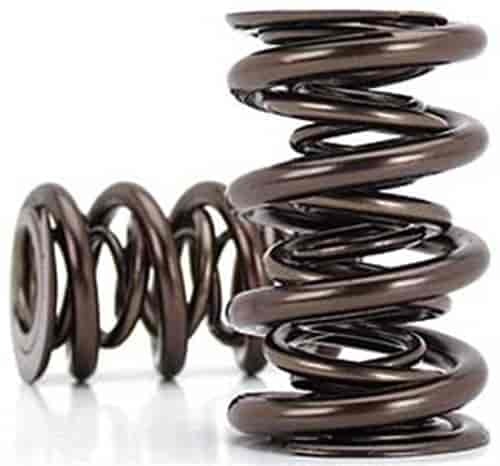 The metallurgists at Comp Cams scrutinize every piece of metal utilized in the creation of Elite Race Valve Springs to make sure they are of unsurpassable quality because fissures within the metal of standard spring wire, caused by molecular contaminants, are the weakest link in valve spring construction. These fissures appear to be immense under the Scanning Electron Microscope but, in fact, are just microns wide. Diminishing the occurrence of these fissures in valve spring steel is the Comp Cams standard when selecting materials. COMP Cams 722-16 - 10° Titanium Retainers Valve Spring Diameter: 1.625"